Jenny's holiday home offers a safe, private setting to relax but also well placed for exploring the South Devon coast. My holiday home is clean, and cosy. Inside you will find a spacious comfortable lounge with TV and dining area. A well equipped kitchen. Two bedrooms with drawer and wardrobe space, share a walk in shower and separate WC with wash basin. All bed linen provided. All rooms are fully furnished, tastefully decorated and have gas central heating. In the summer a furnished decking area with barbecue makes a great outdoor living space. There's a lot to keep the children happy. Heated swimming pool, aqua jets, adventure play ground, family football, body zorbs, Teen virtual reality (small fee ) Also Indoor soft play sister site, its free to use. Walking along the South Devon coastal path is popular. Enjoy stunning coastal views. The Dart valley Trail, an area of outstanding natural beauty is close-by. Walking book at holiday home. Another way to explore is by steam train, ferry and river cruise. Highlights ferry to the charming historical town of Dartmouth and river cruise along the Dart estuary. After a day of exploring relax and unwind at the Oasis spa centre. ( sister site ) Facilities include indoor pool, sauna, steam room, jacuzzi and gym. Its free to use! In the evening enjoy live entertainment at the Oceans Bar ( quizzes, live entertainment, karaoke ) Free Wi-Fi available. Included in the rental rate is a activities park pass, courtesy call by telephone and Jenny's contact number should you have any questions before or during your holiday. For free advice please contact Jenny using the contact buttons below. 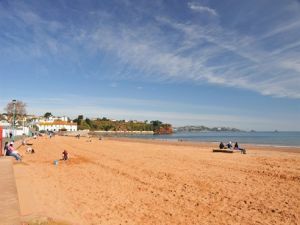 Paignton is a traditional sea side town and is located on the South Devon coast. A popular holiday destination because of the mild climate and family fun days out. In the Summer time head for the beach. Goodrington beach ( a short walk ) is the best place to paddle. Splashdown Quay West Water Park is also here. Paignton zoo is the town's famous attraction and a good day out. The Dart valley trail is a 16 mile attractive riverside walk. Watch-out for the river taxi if you can not make the whole way. Dartmoor national park is short drive away, an area of outstanding natural beauty. Other pursuits include biking and horse riding. The Dartmouth Steam Railway and River Boat Company offers a round robin trip starting from Paignton and Goodrington or a jubilee pass that allows you to explore over 5 days. Bus service to Torquay and Brixham. Service 12 on the main road 10 minute walk from Beverley Bay. Living coasts is a marine zoo with underwater viewing areas. To the South about 5 mile around the bay is Brixham. A charming fishing village and Berry head nature reserve for you walkers. The woodlands adventure park on the Totnes road is highly recommended. There's rides, indoor soft play, zoo and adventure playground. Take some sandwiches, food can be pricey. National trust members should visit Greenway house and gardens, once the holiday home of Agatha Christie. Book car park in advance or catch steam train from paignton to Greenway Halt. Walk to house. A £100 booking deposit secures holiday dates and is non refundable, confirmed by email. Full payment is required 6 weeks before arrival date. Last minute holidays are subject to a change over clean and must be paid in full by Secure PayPal. Alternative dates will be offered. Cancellations 4 weeks before holiday receive 50 % refund. Booking deposit non-refundable. All gas and electrics included in the rental rate. This listing for a privately owned static caravan rental has been viewed 22029 times.